Marvel at the neuroscientific reasons why smart teens make dumb decisions! Behold the mind-controlling power of executive function! Thrill to a vision of a better school for the teenage brain! Whether you're a parent interacting with one adolescent or a teacher interacting with many, you know teens can be hard to parent and even harder to teach. The eye-rolling, the moodiness, the wandering attention, the drama. It's not you, it's them. More specifically, it's their brains. 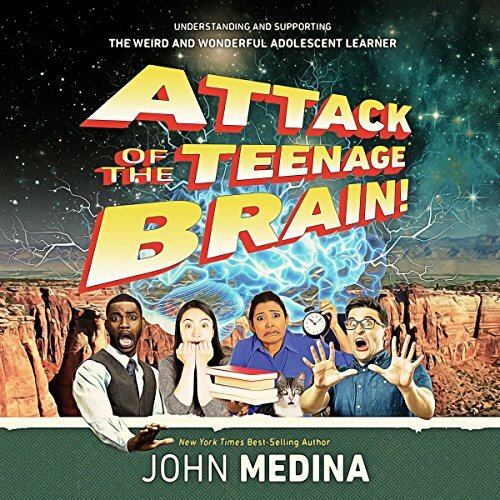 In accessible language and with periodic references to Star Trek, motorcycle daredevils, and near-classic movies of the '80s, developmental molecular biologist John Medina, author of the New York Times best seller Brain Rules and Brain Rules for Baby, explores the neurological and evolutionary factors that drive teenage behavior and can affect both achievement and engagement. Then he proposes a research-supported counterattack: a bold redesign of educational practices and learning environments to deliberately develop teens' cognitive capacity to manage their emotions, plan, prioritize, and focus. Attack of the Teenage Brain! is an enlightening and entertaining listen that will change the way you think about teen behavior and prompt you to consider how else parents, educators, and policymakers might collaborate to help our challenging, sometimes infuriating, often weird, and genuinely wonderful kids become more successful learners, in school and beyond. After listening to the attack of the teenage brain I realized how important this would’ve been for me to know growing up. And for me to know as a parent of three children And numerous teenage foster children. I wish also that our educators would be informed to work with our teenagers in a way that would really help them. Great book give it to all your students teachers. Make sure they read it. Thank you John for this information.